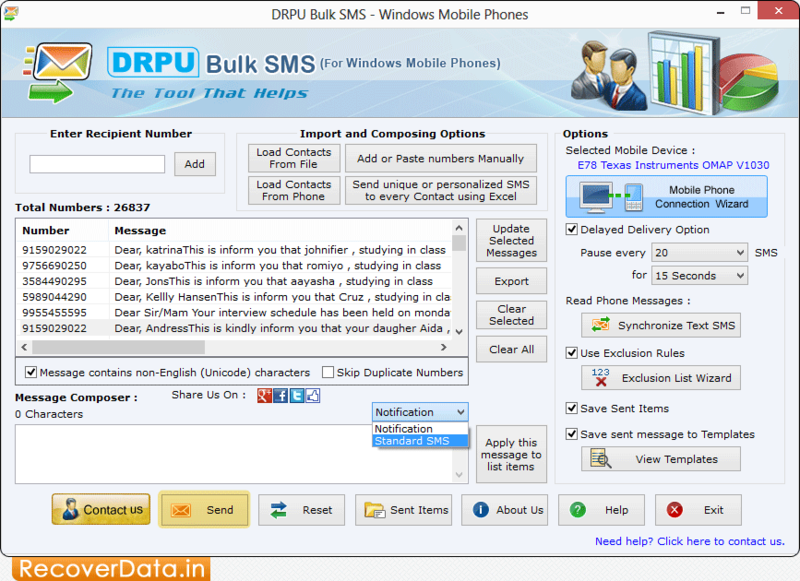 Bulk SMS Utility for Windows Mobile Phone helps you to broadcast bulk text messages from PC via Windows based mobile phone. Text Messaging software sends personalized SMS, event notification, season greetings, invitation, job alerts and promotional campaigns. 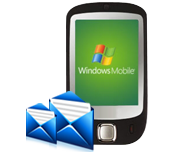 Software deliver SMS from computer to mobile phone via using Microsoft Active Sync and Windows Mobile Device Center technology at national and international level. Message Sending program provides support to all major PDA or Pocket PC mobile phones including Hitachi Pocket PC phone, Sharp W-Zero3 Pocket PC Phone, Anextek, Audiovox PPC 5050, Asus, HP iPAQ, Motorola MPx200, HTC, Samsung Pocket PC phone, Siemens, O2 Xphone etc. Software provides facility to send bulk messages to individual or list of contacts. Using this advanced application, you can compose and send multiple SMS in Unicode languages. Software provides an option to send text messages using delayed delivery mode.